The first Islamic Visa Card in the UAE providing extra flexibility and secure alternative to cash payments. (1) Free for the first year. (2) 20% of annual fee collected donated to Football Club printed on your Card. (3) 4 Free Supplementary Cards until further notice. 5th Card onwards charged for. For all Cards, Takaful contribution amount will be linked to the Primary Card. (4) The Monthly Profit Rate applies for covered card booked until 15th May 2015 only. (5) Whichever is greater. Includes cash withdrawal at ATMs, Exchange Houses or similar, transfer original cover of the Card to Bank Account. Please note that all Transactions at merchants classified as “Security Brokers/Dealers” (under Visa Merchant Category Code 6211) including but not limited to National Bonds Corporation Transactions shall be subject to a 3% fee of the Transaction amount or a minimum AED 90, whichever is greater. Additionally, such Transactions will not qualify for Etihad Miles, Cashback or any other reward scheme. This change is effective 1st November 2016. (6) For damaged Cards. No fee shall be applicable if the Cardholder delivers the damaged Card to the branch. (7) Added to the Non-AED transactions’ wholesale foreign exchange market spot rate that is selected and applied by Visa on the date of conversion. 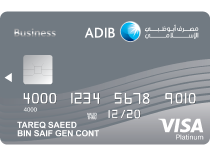 (9) Includes the fee of ADIB as an agent of the Cardholder. (10) The Monthly Profit Rate applies new covered card booked from 16th May 2015 onwards.